Talking specifically about CVE-2016-7237, this fix was applied to "lsasrv.dll", which affected the LSASS service. The vulnerability affected all Windows versions, either 32 or 64 bits, and was reported and later described in more detail by Laurent Gaffié (@PythonResponder) the same day that the fix was published. 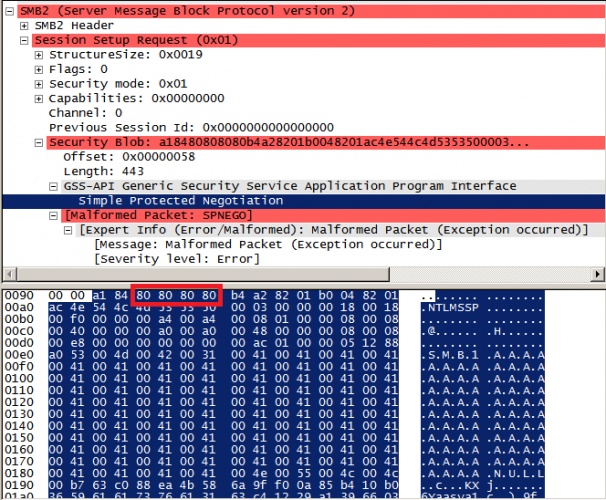 He also published proof-of-concept (PoC) code triggering the vulnerability. Basically, this vulnerability was reported as remote Denial of Service, where the crash is produced via a NULL-Pointer dereference. When the LSASS service crashes, the target is automatically restarted after 60 seconds, which is not very nice when it's a production server. "This allows an attacker to remotely allocate a huge chunk of memory, for a message never larger than 20000 chars ..."
Basically, this vulnerability is exploited via SMB1 or SMB2 through the "Session Setup Request" packet when the target receives a Security Blog with a huge "Simple Protected Negotiation" size. If this function returns the value 0x90312 (SEC_I_CONTINUE_NEEDED), then the huge allocation will be made by the "LsapAllocateLsaHeap" function. As this allocation is close to 4GB, this will probably fail. If the allocation fails, one of the necessary conditions to reproduce the NULL-Pointer dereference will be reached. Basically, the fix checks that a structure pointer that contains a pointer to a CRITICAL_SECTION object won't be NULL. There was a misunderstanding here about the vulnerability, because according to the PoC released by Laurent Gaffié, the problem WASN'T in the structure pointer, but rather in one field of the CRITICAL_SECTION object pointed by this structure, which is NULL when the huge allocation fails ! Although the public PoC doesn't trigger the vulnerability in Windows 8.1 or Windows 10, the researcher and Microsoft declared these Windows versions as vulnerable. As I said before, the "NegGetExpectedBufferLength" function reads the evil size from the SMB packet. Now, this function has to return the 0x90312 value (SEC_I_CONTINUE_NEEDED) to produce the fail in the huge allocation. Unfortunately, in the latest Windows versions, an extra check was added in this function which compares the evil size against 0xffff (64KB). If the evil size is greater, this function won't return the 0x90312 value, but rather this will return the 0xC00000BB value (STATUS_NOT_SUPPORTED), which won't produce any allocation fail resulting in the vulnerability not being triggered. On the other hand, if we use the evil size with a value less or equal than 0xffff (64KB), the allocation won't fail and again, the vulnerability won't be triggered. So, why are Windows 8.1 and Windows 10 vulnerable? Although the bug is triggered when a memory allocation fails, that doesn't mean that the allocation has to be giant, but rather that the LSASS service doesn't have enough available memory to allocate. 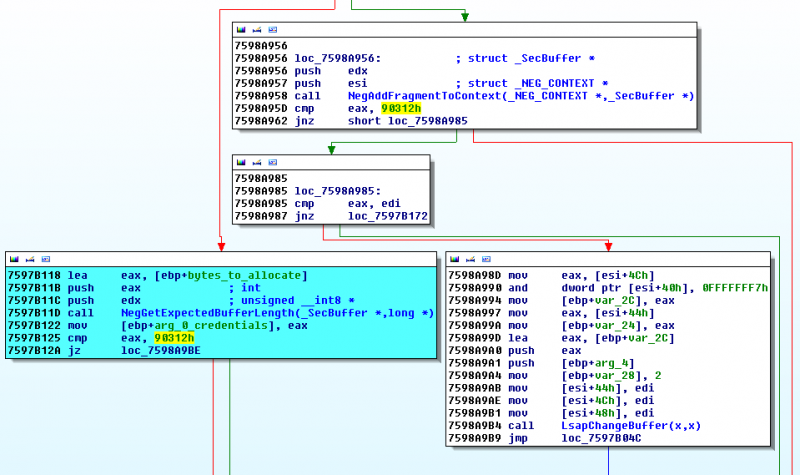 I had been able to confirm that this vulnerability can be triggered in Windows 7 and 2008 R2 by establishing several SMB connections and sending evil sizes with values like 0x1000000 (16 MB). The problem is that in the case of the latest Windows versions, it's not possible to use this kind of sizes, because as I said before, the limit is 64KB. So, the only way to trigger this vulnerability should be by producing a memory exhaustion in the LSASS service. It may be possible to do so by finding a controllable malloc in the LSASS authentication process, creating multiple connections and producing a memory exhaustion until the "LsapAllocateLsaHeap" function fails. Maybe, this memory exhaustion condition could be easily reached in local scenarios. I realized that the fix wasn't working when I tried to understand why the public PoC wasn't working against Windows 10. It's surprising to see that nobody else noticed that –that we know of-, and that a considerable amount of Windows users have been unprotected for more than 2 months since the public exploit was released. As of January 10th, Microsoft decided to release a new security bulletin including a patch for the affected systems (MS17-004). If we diff against the latest "lsasrv.dll" version (v6.1.7601.23642), we can see that the vulnerability was fixed by changing the "NegGetExpectedBufferLength" function. 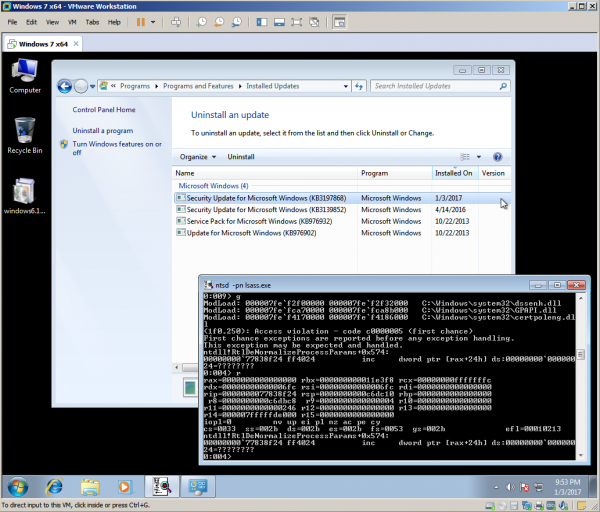 Basically, the same 64KB packet size check used by Windows 8.1 and Windows 10 was now added to the rest of the Windows versions.